Weighty Matters: An Amazing $15.99 Nutritional Stocking Stuffer! 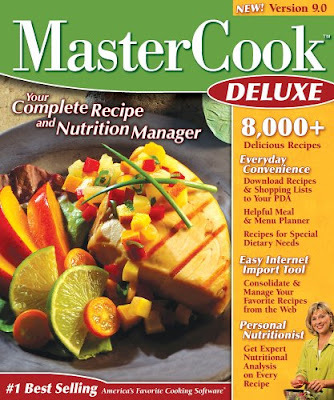 It's called Mastercook and it's a recipe manager program. Like many such programs it'll compile and store all of your family's recipes, it has a shopping list generator and thousands of built in recipes. However there are two things that really set this one apart for me. Firstly it's got this great feature that allows you to cut and paste a recipe from virtually any recipe website directly into your cookbooks. Secondly it's got a nutritional database built in and with the click of a button you can immediately get a nutritional breakdown of your recipe (calories, vitamins, carbs, protein, sugar, fibre, etc.) and best of all, it's scalable (meaning enter all of your ingredients and then enter how many servings you served and it'll scale the nutritional information down for you). I love the program and for $15.99 CAD from Amazon.ca it's tough to go wrong (for some reason Amazon.com charges more - $18.99 USD). If you're interested, links to both Amazon.ca and Amazon.com are below.